Everything you write is treated in confidence and everything I’m writing to you is for you alone! If you don’t believe in what you are doing, I can't help you. This goes for any spell: If you believe in it, it will work. Waiting for results and suspicion are forbidden and doubt destroys spells! You need to tell me if you have ever contacted any other mages before, in order to avoid the imposition of vibration between each other. Generally spells take effect very quickly, sometimes within hours or a few days. The spells will work, and you should allow them to work once they are in motion. After my work is done, you should not contact me again or ask about the spellwork. Don’t give me questions. If you will need to do something, I’ll tell you! I guarantee to give you the highest possible service at all times. 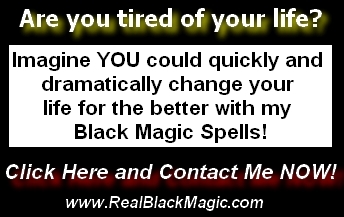 Please, don't bother me with questions like "will your black magic hurt me?" or "can you bring him back in 24 hours?" or "can you cast a money spell and I will pay you later" or "is it possible to pay half or after the results have taken place?" because you wont get an answer. I am a serious spell caster for serious people. I can see auras and the spirits that flowed through the earth. I know all the answers to all your questions and I can give you the answer what to do. I have amazing abilities with aura drawing, palmistry, crystal ball gazing, mind reading and telepathic methods, astrology and spell casting. My black magic is not evil. I have over 26 years experience and have the skills and power to command Ancient Spirits and the Eternal Elements, and I am said to be the best. I have discovered hidden texts and secrets locked away for generations. The spells that I use are from very old ancient scrolls and manuscripts, that were passed down through my family (from Europe) since the 14th century, and have been tested through the years as being completely safe, with no after effects, bad karma, or bad luck. I use full occult protection at all times, nothing has ever gone wrong, nor will it. these elements to safely cast spells. I want to be able to offer the best and strongest spells. That is why I am using real black magic. If you have a complex situation then I urge you to Contact Me.